While this isn’t the first time a big company has done this (Github for one also did this), it seems unbelievable that a big company like Twitter would get itself caught out by this basic, common sense security practice. Pretty much every YouTube video and article about correctly handling passwords will tell you not to store them in the clear and only store them as hashes (with salts, preferably). Hashing algorithms are meant to be really difficult or impossible to reverse, meaning you can’t (easily) use the hashes to determine the original passwords. 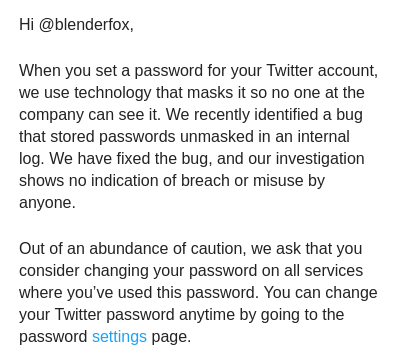 The fact that Twitter has our unencrypted passwords on disk… does this mean Twitter has been saving our original passwords before hashing them? Twitter users who had their accounts on private may not have been as private as they initially thought…. This is not going to end well…. Facebook have been having a lot of bad publicity lately (and I would personally say it’s long overdue) and a lot of it over privacy. Now, there’s talk about Facebook lifting SMS and phone call information from Android phones with consent. Yes, Facebook asks for it, but you can (and should) refuse it access. 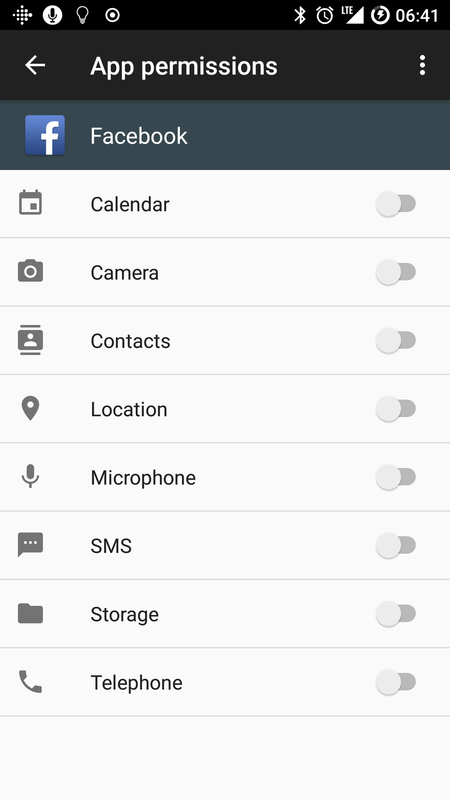 Later versions of Android allow you to revoke and change the permissions given to an app, and also prompt you again if the app asks for it. 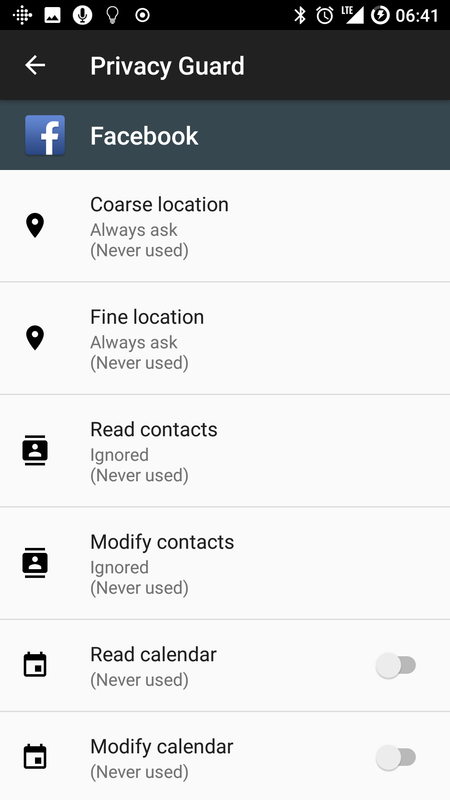 My Facebook app has very little permissions on my device because I don’t trust it a single bit. I also have Privacy Guard enabled and restricted. Whenever it wants to know my location, I can refuse it. Whilst finding vulnerabilities is a bad thing, having them found by white hat hackers is a good thing. Hackathons like this one prove that it can be constructive to get a group of them in to find and help fix vulnerabilities in your system before they are found in public and exploited to death before you have a chance to fix them. The US Air Force’s second security hackathon has paid dividends… both for the military and the people finding holes in its defenses. HackerOne has revealed the results of the Hack the Air Force 2.0 challenge from the end of 2017, and it led to volunteers discovering 106 vulnerabilities across roughly 300 of the USAF’s public websites. Those discoveries proved costly, however. The Air Force paid out a total of $103,883, including $12,500 for one bug — the most money any federal bounty program has paid to date. Kubernetes is an awesome piece of kit, you can set applications to run within the cluster, make it visible to only apps within the cluster and/or expose it to applications outside of the cluster. As part of my tinkering, I wanted to setup a Docker Registry to store my own images without having to make them public via docker hub. Doing this proved a bit more complicated than expected since by default, it requires SSL which requires a certificate to be purchased and installed. Enter Let’s Encrypt which allows you to get SSL certificates for free; and by using their API, you can set it to regularly renew. Kubernetes has the kube-lego project which allows this regular integration. So here, I’ll go through enabling an application (in this case, it’s a docker registry, but it can be anything). I’m tying the registry storage to a pv claim, though you can modify this to tie to S3, instead etc. Once you’ve applied this, verify your config is correct by ensuring you have an external endpoint for the service (use kubectl describe service registry | grep "LoadBalancer Ingress"). On AWS, this will be an ELB, on other clouds, you might get an IP. If you get an ELB, CNAME a friendly name to it. If you get an IP, create an A record for it. I’m going to use registry.blenderfox.com for this test. Verify by doing this. 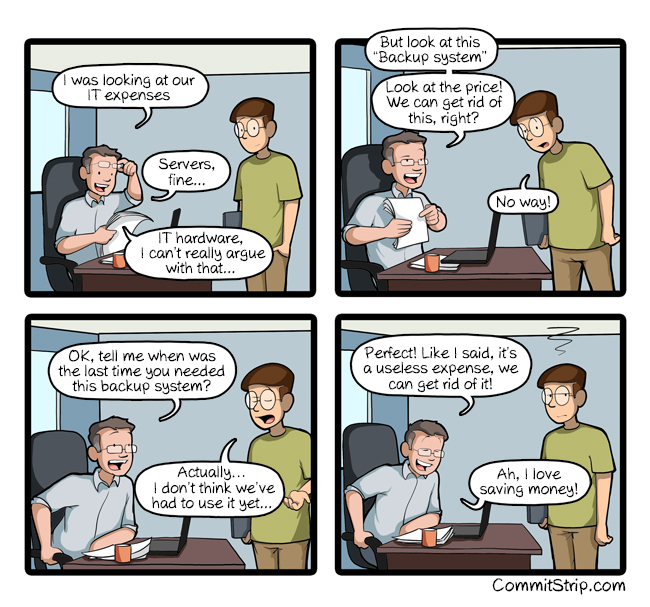 Bear in mind it can take a while before DNS records updates so be patient. If done correctly, this should resolve to the ELB then resolve to the ELB IP addresses. Next, try to tag a docker image of the format registry-host:port/imagename, so, for example, registry.blenderfox.com:9000/my-image. Next try to push it. So let’s now fix that. Open up nginx/configmap.yaml and change the body-size: "64m" line to a bigger value. This is the maximum size you can upload through nginx. You’ll see why this is an important change later. kubectl describe service nginx -n nginx-ingress | grep "LoadBalancer Ingress"
Look for the value next to LoadBalancer Ingress. On AWS, this will be the ELB address. CNAME your domain for your service (e.g. registry.blenderfox.com in this example) to that ELB. If you’re not on AWS, this may be an IP, in which case, just create an A record instead. Open up lego/configmap.yaml and change the email address in there to be the one you want to use to request the certs. Wait for the DNS to update before proceeding to the next step. *  subjectAltName: host "registry.blenderfox.com" matched cert's "registry.blenderfox.com"
Note we are not using a port this time as there is now support for SSL. An Intel flaw that has been sitting hidden for a decade has finally surfaced. Being on the chip rather than the OS, it doesn’t affect a single OS — with Linux, Windows and MacOS being mentioned in this article. Bipul Lama believes Facebook is spying on him. And he’s got proof, sort of. Lama performed a test. For two days, all he talked about was Kit-Kats. “The next day, all I saw on my Instagram and Facebook were Kit-Kat ads,” Lama said. After his Kit-Kat experiment, he successfully repeated it with chatter about Lysol. The 23-year-old musician is now more convinced than ever that Facebook is listening to his conversations through his phone’s microphone. “It listens to key words. If you say a word enough times, the algorithm catches those words and it sets off targeted ads,” Lama theorized. Lama is far from alone. The belief that Facebook is actively listening to people through their phones has become a full-on phenomenon. Facebook has, of course, denied it does this. That has done little to dampen the ongoing paranoia around the theory. Because it is just a theory… right?